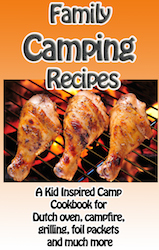 Kids Campfire Cooking and recipes for outdoor cooking for kids. 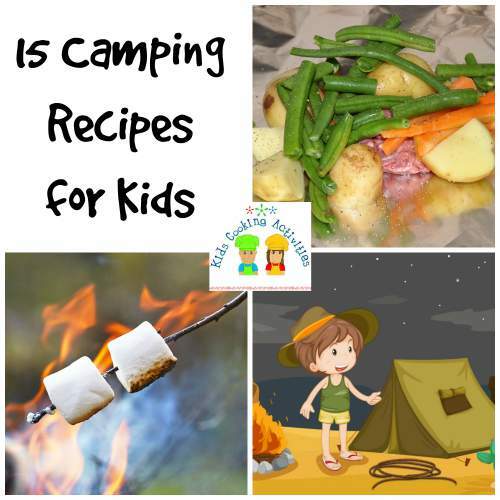 Everything tastes better roasted over an open fire maybe that is why kids campfire recipes are so popular. Camping can be a great family activity and something kids will remember throughout their life. 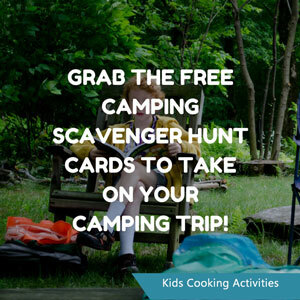 Here are some outdoor cooking for kids recipes, camping meal ideas and tips to help make your camping trip extra fun. 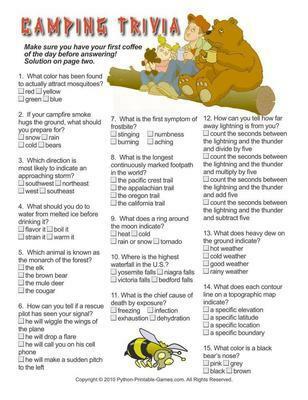 Use caution around a campfire. Keep hands and feet away from fire. To prevent falling into the fire, don't play around a campfire. When cooking on a campfire use long potholders and/or have an adult help. When you are done with your kids campfire cooking, make sure the fire is totally out. Sprinkle water on the fire and stir the ashes around with a stick. In half of muffin tin place 6 eggs in 6 holes. Sprinkle with shredded cheese and chopped ham. In other 6 holes of muffin tin, add diced potatoes and season with salt and pepper. Bake on a flat rock over the campfire or on a cooking grate. Start with Bisquick in a zip-lock bag. Make a well in the Bisquick, and add some water. Mix with a stick, and eventually cover the end of the stick with the dough. Toast over the fire, until cooked through. Roll in melted butter and cinnamon/sugar mix. Enjoy the sweet biscuits for breakfast or a snack. In a bowl, mix together the cinnamon and sugar, then sprinkle over the pears in the pan. Toss together the granola and dried cranberries, then fill the indentations in the pears with all the mixture. Drizzle the apple juice over the pears, then cover with foil and crimp sides tightly so pan is sealed well. You can precook these at home in the oven. Just put in 350 degree oven for 15 to 20 minutes or until the pears are soft. Then transfer to campsite and reheat in pan over a slow fire. To cook at campsite, place this pan on a grate over glowing coals. Let cook for 15 to 20 minutes, depending on the heat of the coals. Serve immediately with a dollop of ice cream, whipped topping, or frozen yogurt. Tear off an 18 inch square of tin foil. In center of each square add 1 teaspoon oil and 1 tablespoon popcorn. Bring corners together and tie with a string. Place on hot coals and shake with a long stick until popcorn is popped. Season with butter and salt if desired. 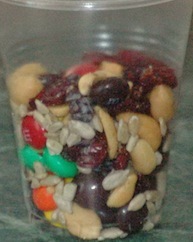 Prepare a snack mix or trail mix before hand. Kids love to prepare their own packet dinner themselves so have all the ingredients out and let them assemble their own. Wrap up the tin foil, use an extra sheet if needed and write with a permanent marker each persons name. Tear off large sheet of tin foil, one for each person. Shape hamburger into patties. Prepare carrots, potatoes, and onion by cutting into circles or small chunks. Arrange everything on kitchen counter and let family assemble their own dinner. Start with the hamburger (or other meat) on the bottom. Season with seasoning salt. Top with vegetables. Sprinkle with more salt and a shake of dry onion soup mix. Add one or two spoonfuls of cream of mushroom soup. This will help make a gravy. Wrap up tin foil. If needed use another sheet of tin foil to make secure. Write name on each packet hamburger foil dinner. Place on a cookie sheet in case the tin foil dinner leaks juice. Place in the coals for 30 minutes. 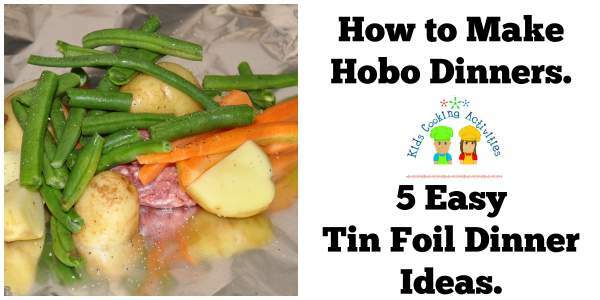 Check one tin foil packet to see if meat is cooked through and potatoes are tender. Be careful of steam when opening dinners. You may need to check several times to test for doneness. Make sure you use a potholder and be careful as the steam will be very hot when opening the tin foil. Place an ear of corn on top of a sheet of tin foil. Add dots of butter and wrap up tightly. Cook in the coals about 15 minutes. 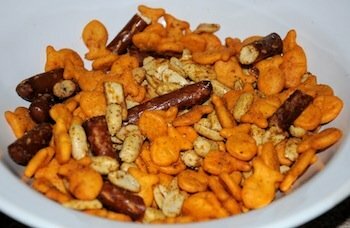 A simple lunch for a camping or hiking adventure. Place cooked hamburger and refried beans in a Ziploc bag. Top with shredded cheese, shredded lettuce and chopped tomatoes. Make one for each camper plus a few extra just because they are so easy and yummy. Bring along a bag of tortilla chips. When lunch arrives dip your chips into the taco salad or break chips into the baggie and eat with a fork. A great reader tip is to use individual size bags of chips and add all ingredients directly in the chip bag. This also makes less clean up which is always great for kids campfire cooking. Prepare meatloaf before hand or bring along a bowl or bag to mix together at the campsite. Cut out center of onion or cut onion in half and scoop middle out. Place meatloaf mixture in each onion and wrap in tin foil. Cook in coals 15-20 minutes and flip over once. cook around 15 minutes -- until veggies are tender -- remember, you can always increase the veggie portions ENJOY! 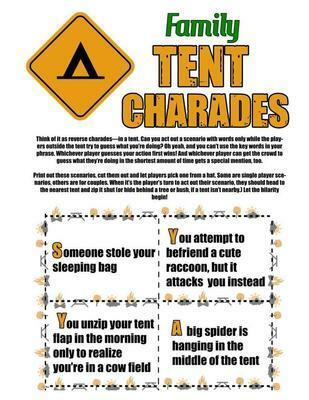 Add some fun to your campout with these printable camping games. Push a stick through a green apple and turn the stick over the coals of a campfire. (as you would when roasting a marshmallow). When the apple peel starts to loosen carefully peel off or have an adult peel skin off. In a bowl mix together cinnamon and sugar then roll your apple around the mixture until evenly coated on all sides. Roast over fire for a few more minutes and let cool. 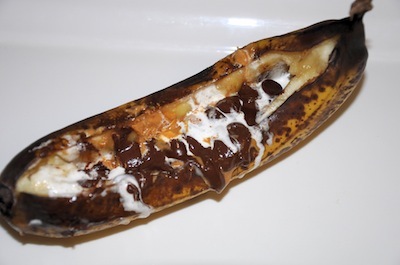 Slit a banana down the middle but leave the banana in the peel. Down the slit sprinkle brown sugar, chocolate bar chopped or chocolate chips and tiny marshmallows. Wrap up in tin foil and warm in coals. Make a traditional s'more simpler and more fun. Roast marshmallows and place between two flat cookies and a miniature candy bar. See more campfire fun desserts. See our reader's favorite campfire recipes. 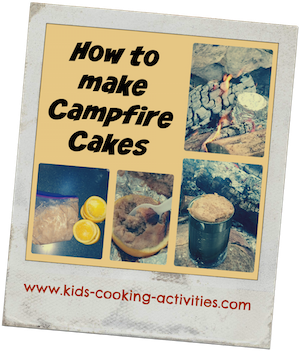 What is your Favorite Kids Campfire Cooking Recipe?